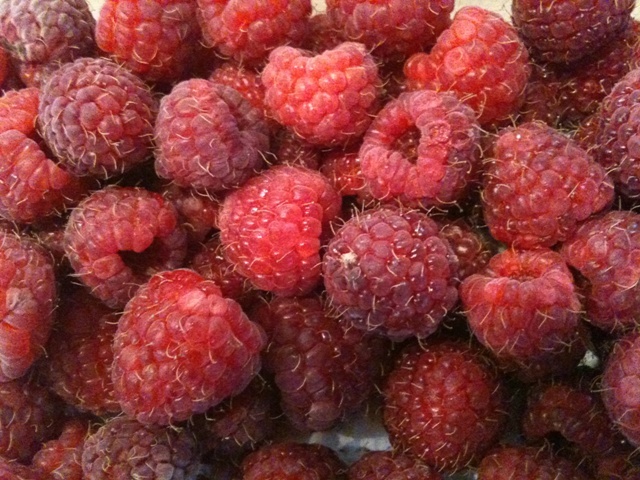 Other names: American raspberry, grey leaf red raspberry. 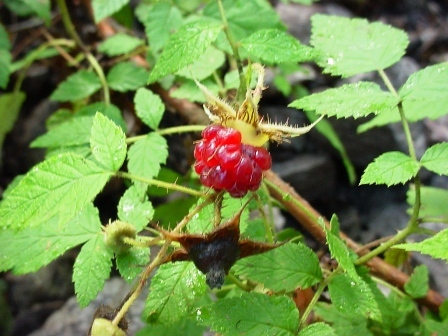 American red raspberry is one of those fruits which are native of North America. It grows widely here particularly the boreal regions. With times, this plant spread to other parts of the world too and can now be seen growing everywhere across northern Europe to north-western Asia. 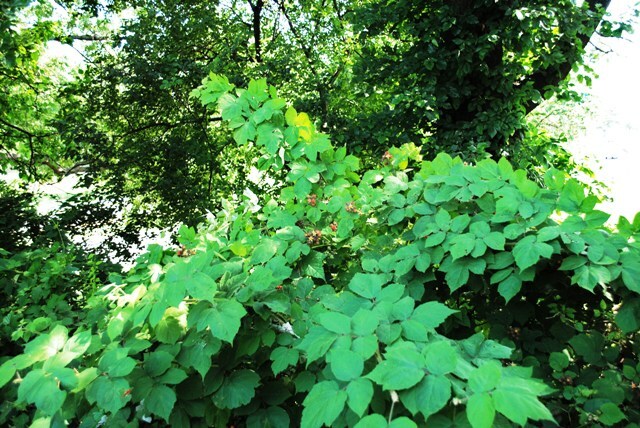 A medium shrub, 0.5-2 m tall, perennial with biennial stems (canes); stems erect to ascending, almost unarmed to prickly and bristly, often glandular-hairy, sometimes smooth and glaucous beneath the prickles; bark yellow to cinnamon-brown, shredding; similar to cultivated raspberry. Leaves alternate, deciduous, pinnately compound, 5-20 cm long; leaflets 3 to 5 on first-year canes, mostly 3 on flowering canes, egg-shaped to broadly lanceolate, 3-10 cm long, double-saw-toothed and sharply long-pointed at the tip, greenish and smooth to sparsely hairy above, paler and greyish-woolly to nearly smooth beneath, the veins and leaf-stalks often glandular-prickly; stipules linear-awl-shaped, 4-10 mm long. Fruits a drupelet, finely and thinly woolly, weakly coherent in a red egg-shaped cluster that falls intact from the dry receptacle (a raspberry), the berries 1-1.2 cm wide. American red raspberry is very popularly consumed in USA and Canada. The fruits are eaten fresh, frozen or canned and made into sauces, jellies, fruit leather and jams. The fruit is a good source of vitamin C and rich in anti oxidants. So it is considered to be a very healthful fruit. This fruit is highly revered by herbalists who believe that the tea prepared from the leaves of this bush is a tonic for the female tract, especially for conditions involving the uterus. Raspberry leaf tea is a classic remedy for painful menstruation and can be taken daily throughout a pregnancy to help with morning sickness. It prepares the uterus for delivery by stimulating contractions while inducing relaxation between them and later can be used as an after birth tonic. It is said to reduce labor pains and helps to bring in breast milk. 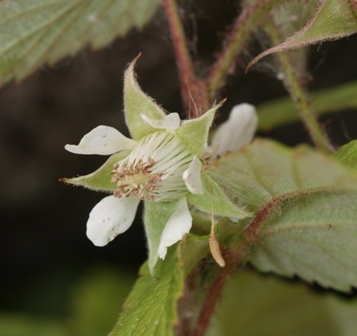 Raspberry leaf has also been shown to help prevent miscarriage and is used to tone the uterus after abortions. The leaf tea is slightly astringent making it a good remedy for diarrhoea. It makes a good gargle and mouth wash as well as a wash for wounds and skin rashes. The infusion of the leaf is used to induce sweating in cases of fever. New plants can be raised from seed as well as cuttings. The seeds are best sown in the early autumn in a cold frame. Stored seeds should be stratified for one month at 3ºC. When the seedlings are large enough to handle place them into individual pots and grow them in a cold frame. The seedlings should be planted at their permanent positions in the late spring of the following year. Asexual propagation can be carried out by hardwood cuttings. These should be planted in a suitable rooting medium for rooting and kept there for minimum one year before planting in the field.